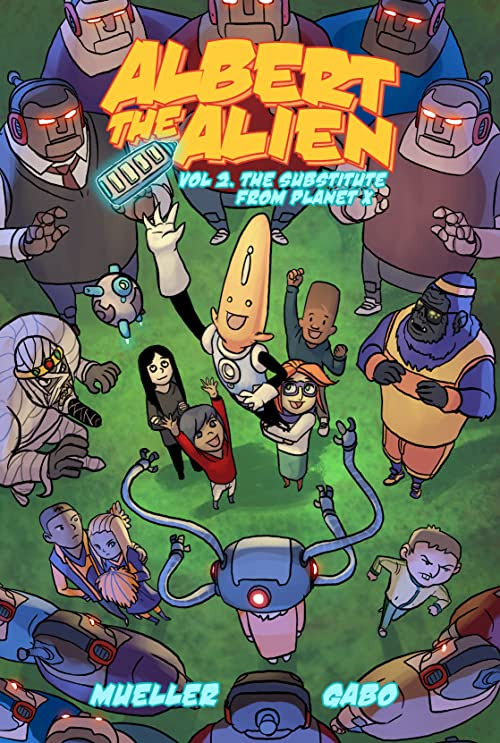 Albert the Alien is the first foreign exchange student from another planet…and someone is trying to get him expelled! Albert has been on Earth for a few weeks now, and all of the kids are excited for the upcoming Homecoming Dance. His adventures have made him super popular in school – much to the dismay of some of the popular kids – and he may even get nominated for Homecoming King! However, when all of the teachers mysteriously call in sick and are replaced by robot substitute teachers, it’s up to Albert and his friends to figure out who’s trying to take over the school…and stop them before they do! Dodging robot hall monitors, battling ancient Mummy Kings on a field trip, and uncovering the mystery of the school mascot thieves, Albert’s newest adventure on Earth is out of this world!